(Left to right) Laura VerMeulen, Assistant Director, The Longhouse Indigenous Arts Campus, The Evergreen State University (TESU); Zoltan Grossman, Geography & Native Studies Faculty (TESU); Tina Kuckkahn-Miller, VP, Indigenous Arts and Education (TESU); Gail Makuakāne-Lundin, Director of Hawai‘i Papa O Ke Ao (UH System); Melanie Wilson, Dean of Liberal Arts (Hawai‘i CC); Hanalei Marzan, Uluākea Scholar-in-Residence (UH Hilo); Puanani Nihoa, Assistant Director, Masters in Public Administration, Tribal Governance Concentration (TESU); Ian Shortridge, Academic Advisor, (Hawai‘i CC-Pālamanui Campus); Kekai Lindsey, Hawaiian Culture-Language Pathways Facilitator (Hawai‘i CC); Linley Logan, Director of the Northwest Heritage Program, The Longhouse Indigenous Arts Campus (TESU); Taupōuri Tangarō, professor of Hawai’i Life Styles (Hawai‘i CC). Down lower at front right is Kauila Keali‘ikanaka‘oleohaililani, Community Engagement Specialist (Hawai‘i CC). 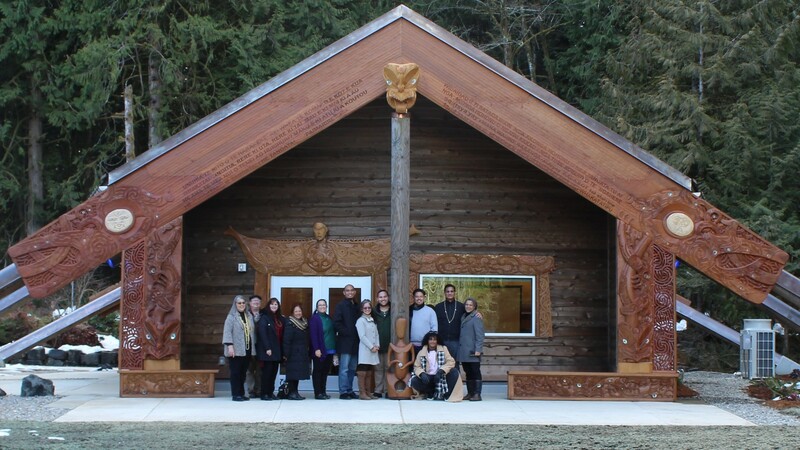 Group is gathered at the Fiber Art Studio, a structure that combines Northwest Indian and Maori architecture, The Longhouse Indigenous Arts Campus, TESU, Olympia, Washington, March 1, 2019. Photo by Ākeamakamae Kiyuna, Hawaiian Culture-Language Pathways Coordinator (Hawai‘i CC). Click photos to enlarge. 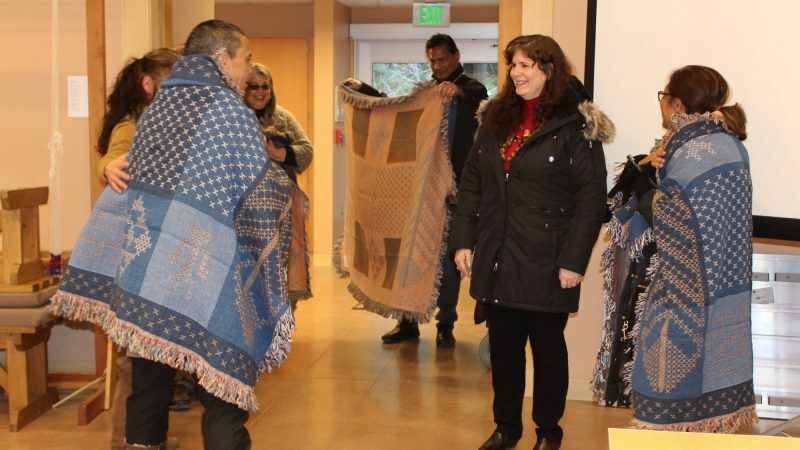 Taupōuri Tangarō (left) and Gail Makuakāne-Lundin (right) presented with an Evergreen Indian Tapestry Throw by Tina Kuckkahn-Miller. The design on the throw replicates tapestry hung in the Fiber Art Studio that represent symbols of some of the Northwest Indian Tribes. Photo by Ākeamakamae Kiyuna. 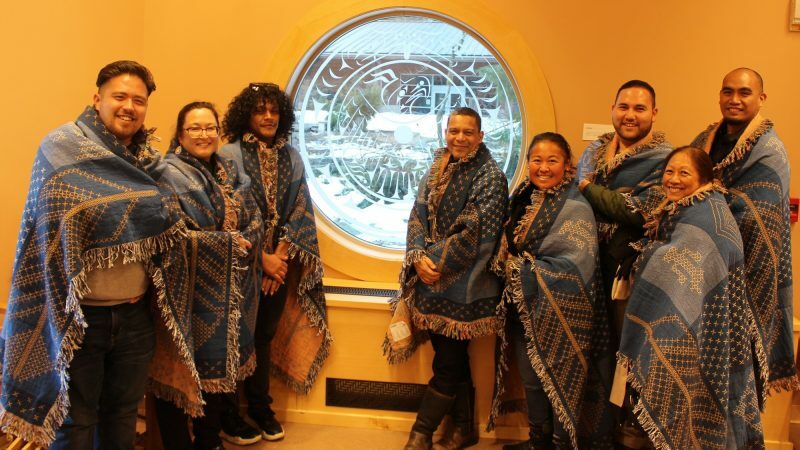 UH Hilo-Hawai‘i CC delegation in the Fiber Arts Studio wearing Evergreen Indian Throw. L-R: Kekai Lindsey, Melanie Wilson, Kauil Keali‘ikanaka‘oleohaililani, Taupōuri Tangarō, Ākeamakamae Kiyuna, Ian Shortridge, Gail Makuakāne-Lundin, Hanalei Marzan. Photo by Ākeamakamae Kiyuna., click to enlarge. 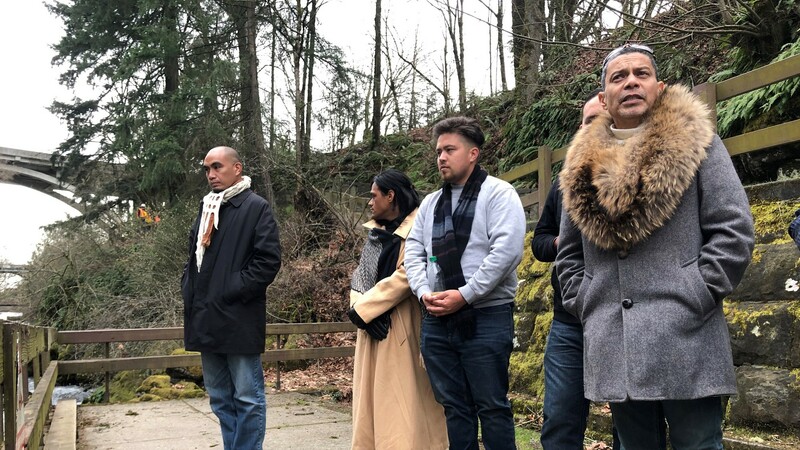 A delegation from the University of Hawai‘i at Hilo and Hawai‘i Community College visited The Evergreen State College (TESU) in Washington state from Feb. 28 to March 3 to continue conversations about modeling an indigenous arts program after Evergreen’s Indigenous Arts Campus and Native Programs curriculum. “The proposed program will pilot a focus on indigenous arts in anticipation that it will grow into a two-year community college program with pathways to a four-year degree,” says Gail Makuakāne-Lundin, director of the UH System Office of Hawai‘i Papa O Ke Ao and interim executive assistant to the UH Hilo chancellor. “The University of Hawai’i welcomes ways to study indigenous cultures as contributors to society instead of simple observations of their art,” she says. 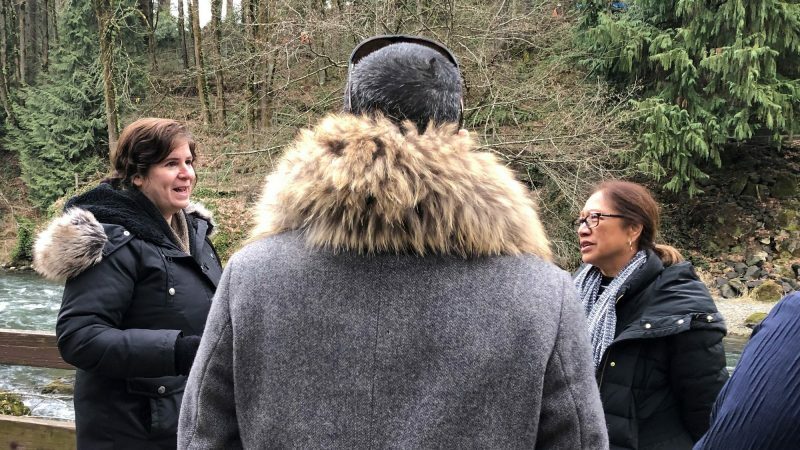 (Left to right) Tina Kuckkahn-Miller, Taupōuri Tangarō, and Gail Makuakāne-Lundin at Tumwater Falls, an area used by the Northwest Indian for ceremonies, trading and gathering of salmon and shellfish. Photo by Ākeamakamae Kiyuna. Group meets at Skokomish Indian Tribe Skabob (Doctor-Medicine) House, which is under construction in Shelton, Washington. (Left to right): Sy Miller (Chief’s son); Chief Dexter Miller; Tina Kuckkahn-Miller (Chief’s wife); Vice President, Indigenous Arts and Education, The Evergreen State University; Taupōuri Tangarō, Director, Hawaiian Protocol and Community Engagement, Hawai‘i CC and UH Hilo performing a Hawaiian chant. Photo by Ākeamakamae Kiyuna. 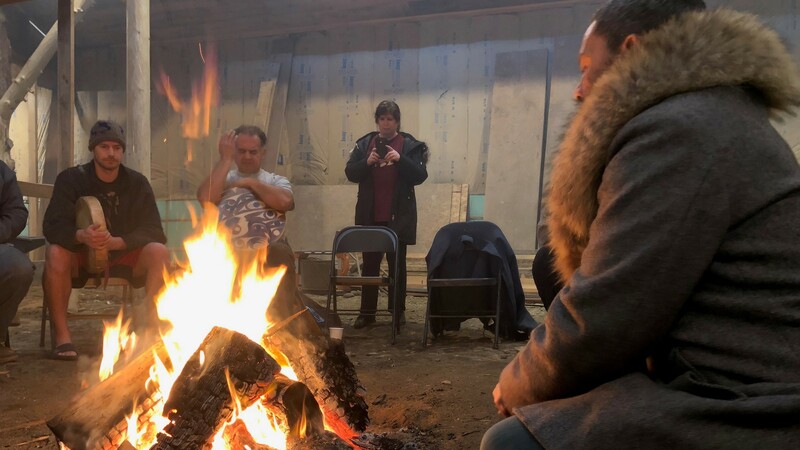 Hawai‘i CC will host a 2019 indigenous arts summer symposium as the first step in gauging community interest and support in the proposed program. -Adapted from Evergreen release. Photos and captions for this post provided by the delegation.